It's interesting to see how things change over the years. About four years ago, I got a glimpse of one of Bob Proctor's video online and heard him talk about the importance of reading to get to know ourselves better. When he said that, something clicked. I had never thought about reading books that would directly benefit me in my day to day life before. How crazy is that!? I always thought books were for fun or to pass my engineering exams. And since I wasn't interested in fiction books, I was done with books after graduating from university. I just didn't read much except for what was required from my job at the time and occasional magazines. Fast forward a couple years later, after getting this new insight from Proctor, a new reason to start reading, I'm planning to read a new book every week in 2016. I went from about 6 books in 2013, to 12 books in 2014 and 24 books in 2015 and now I'm planning to read 52 books this year, something I never would have even considered just a couple years ago. Why so many books? First because there's so much to learn from so many amazing people who've gone through various experiences and took the time to pass on their information to anyone interested. Second, because the more I hear various concepts I'm not familiar with, the better I understand them. I get to view them from various perspectives which gives me a wider perspective on everything. When it comes to deciding on what books to read, I have a list composed from recommendations and suggestions based on what I read and people I follow, but I'm also open to whatever falls into my lap when I look for books. Sometimes, random books catch my attention at the right time and that's something I'm very open to. Having access to audiobooks from the Toronto Public Library is also a major factor in my ability to go through so many books. It's great to see that libraries are evolving with our times. You can still get physical copies of book in various locations (which is great), but you can also borrow ebooks and audiobooks from the comfort of your home and even directly from your phone. If there's something you'd like to fix, change or better understand in your life, chances are there's a book for that. I encourage you to start reading books that will benefit you in your day to day life. It's definitely one of the best habit I picked up a couple years ago. 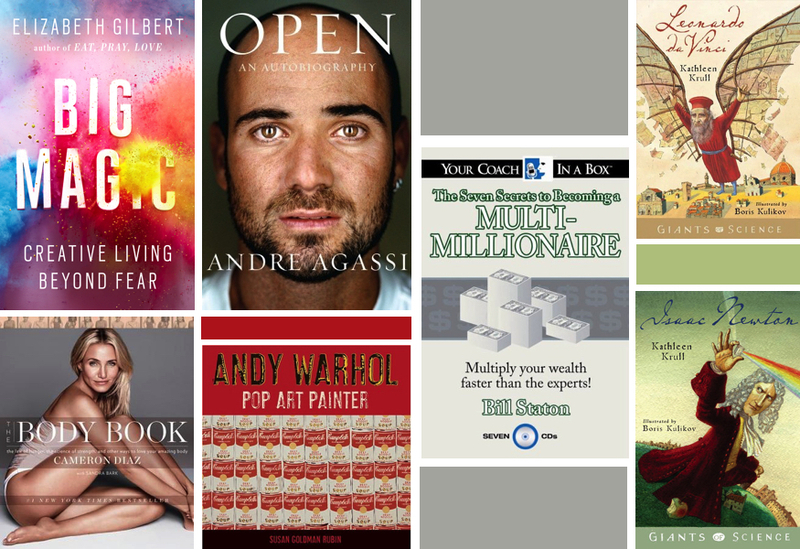 So far this year, I've read Big Magic by Elizabeth Gilbert, Open by Andre Agassi, The Body book by Cameron Diaz, Andy Warhol Pop Art Painter by Susan Goldman Rubin, The Seven Secrets to Becoming a multi-millionaire by Bill Straton, Leonardo DaVinci and Isaac Newton both by Kathleen Krull. I might write a couple reviews in the future. But Big Magic had some great concept about ideas and creativity, Agassi gave me a glimpse of what it takes to be number 1 in the world, Cameron Diaz had some neat little tricks that I started to integrate in my days sparked my curiosity about health and fitness.